Client-Based Writing Program is preparing students to write professionally in the workplace. For mechanical engineering major Eric Roper, it’s fair to say that writing was not one of his favorite subjects. But as a senior trying to prepare himself for a career that involves writing reports and procedures, he needed to have a basic skill set under his belt. That’s where professor Ashley Cowden’s technical writing class last fall came into play. A part of Clemson’s Client-Based Writing Program, the class provided Roper the opportunity to experience writing and formatting technical documents in a real-life setting, while gaining the knowledge that would prepare him for future technical writing projects he may encounter in the workforce. Having been recently ranked among the top 10 in U.S.News & World Report’s list of schools with the highest percentage of students holding internships or co-op positions, Clemson takes pride in offering programs and opportunities to provide students with this type of real-world experience. The Client-Based Writing Program pairs business and technical writing classes with local clients, such as nonprofit organizations, public schools, corporations and University departments, that need communication deliverables. In teams, students complete deliverables that range from white papers and research reports to brochures, instruction manuals and multimedia presentations. Established in 2003, the program has garnered impressive statistics. More than 4,361 students in more than 220 sections of business and technical writing have partnered with clients, and more than 30 writing faculty and 176 clients from the campus and community have participated in the program. Cowden, director of the program, has witnessed its development since the beginning. “We started out doing a lot of environmental projects and sustainability, because that’s where a lot of the funding was and we felt very passionate about that,” she said. Since then, the program has branched out in terms of the clients and projects that it undertakes, developing a strong reputation and a long list of clients ranging from Clemson Dining Services to Anderson Adult Education and Habitat for Humanity. Richard Gaines, director of Anderson Adult Education Center, has been working with professor Philip Randall’s classes for the past three years, and admires the creativity and commitment displayed through each project and semester. The classes have assisted with a variety of projects, including marketing efforts, boosting morale of students and faculty through building enhancements and surveys, communicating GED requirements and research. A goal of Randall’s is to enable students to excel in business writing while using their talents to positively impact society by solving real problems in the real world. In addition to teaching and recruiting clients to participate in the program, Cowden is responsible for recruiting faculty members like Randall and orienting them to an approach unlike most of their other classes. Classes are very much student-centered, as class members work directly with clients. And faculty members collaborate with their students in a variety of ways throughout the process. “In the beginning of the semester,” Cowden said, “we’re teaching a lot of the theory, how to perform good audience analysis, what a good proposal sounds like, how to do research, and so on.” Once the class moves forward in the process of actively working with a client, the professors direct students’ attention to the client when they have questions. And while Cowden and other faculty members don’t tell students how to solve problems, they do work to guide them toward finding a solution. “The client comes and says, ‘Here’s my problem, and here’s what I think I need.’ I know in my head how I would do it, and I try to ask students questions to help them get there, but I try to let them figure that out on their own,” she said. And watching them succeed is especially rewarding, according to Cowden and Randall. Cowden views the program as one of the more unique experiences offered at Clemson. In all its efforts, the Client-Based Program is motivating business and technical majors to develop writing skills that will be useful in their careers. And with these new skills, students are building résumés while also building character through using their knowledge for the betterment of the Clemson community and surrounding areas. AMECO division of Fluor Corp. While that was never verified, Smith Magazine popularized the idea of six-word memoirs several years ago, inviting online readers to share their six words on life, happiness and more. It seemed a perfect challenge for Clemson alumni, who, from both anecdotal and formal research, are among the most loyal in the country. Start a cadence count almost anywhere and any alum within earshot will pick it up. So we threw out the question on our Clemson World Facebook page: “How would you describe your Clemson experience in six words or less?” We’ll give a little slack to those grads for whom mathematics isn’t a strong point — some of our six-word memoirs stretched to seven, or eight, or even 18. But it was clear in reading through them that the memories of the education gained and relationships formed have resulted in an incredibly strong Tiger pride. This is a visual representation of the many responses posted on Facebook. The larger the word, the more times it was used. And, yes, “thermodynamics” really was part of one six-word description. Nine billion. That’s how many people will inhabit the earth by 2050. How do we feed nine billion people? How do we feed them well in a way that is both economically and environmentally sustainable? In a way that will make a profit and open new markets for farmers while leaving the planet a place where those nine billion people and their descendants will want to live? These are some of the big questions being asked and answered by Clemson’s Sustainable Agriculture Program, the centerpiece of which is the Student Organic Farm (SOF), a 15-acre working organic farm and experiential teaching center dedicated to researching profitable, practical sustainable farming techniques that can benefit students and farmers across the state. In 2001, the area between Hartwell Lake and Perimeter Road known as “The Bottoms” was primarily being used to test row crop varieties and grow feed for livestock at the Clemson livestock farms. A group of faculty from the College of Agriculture, Forestry and Life Sciences (CAFLS) suggested the land be used to create a small market garden that would produce fruits, vegetables and flowers for sale to consumers on campus and in the local community. That group of faculty included Geoff Zehnder, professor of entomology in the School of Agricultural, Forest and Environmental Sciences (SAFES) and director of Clemson’s Sustainable Agriculture Program. “We secured a USDA Sustainable Agriculture Research and Education training grant and started with four 100-square-foot plots for vegetable production and four small areas for growing medicinal and edible herbs, blueberries and beneficial insect-attracting plants,” said Zehnder. In 2005, the SOF earned its organic certification from the Organic Certification Program in Clemson’s Department of Plant Industry. Today, with funding from grants and produce sales through its Community Supported Agriculture (CSA) program, that former market garden is a productive organic farming operation and a showcase for sustainable farming techniques that advances Clemson’s land-grant heritage of teaching, research and extension and embodies Thomas Green Clemson’s founding vision of an agricultural college that would help the people of South Carolina prosper through instruction and outreach in the agricultural and natural sciences. The SOF is located on land that is part of an area with a deep agricultural heritage and is now officially named “Calhoun Fields.” The land is said to have first been farmed by Cherokee Indians, then by John C. Calhoun and Clemson himself back in the days when a man’s gait was measured in furrows because he plowed his acreage walking behind a mule-drawn sodbuster. Back long before there was a university or before Clemson President Robert Cook Edwards (1958-1979) saved the land from inundation by Hartwell Lake. Back in the days when the food we put on our tables and in our mouths was born of the sweat that stung our eyes and our own callused and mud-streaked hands. Sustainable agriculture is more than just an abstract idea. The results of a strong sustainable agriculture operation are measurable as increased profitability, decreased farm debt and purchase of off-farm feed and fertilizer, and reduced reliance on government subsidies. This is accomplished by working with nature rather than against it. On a perfect sustainable agriculture operation, there is no bare ground. Clean water flows through the farm’s ditches and streams. Wildlife is abundant and the farm landscape hosts a diversity of vegetation. Crops are diversified and plant and animal agriculture is integrated, reducing market risk and increasing profit. Solar energy is captured and used across the farm systems. The water cycle is managed in a way that reduces surface runoff, soil surface evaporation, and drought and flood incidence, and increases transpiration by plants and seepage into underground reservoirs. And a well-functioning mineral cycle moves nutrients from the soil through the crops and animals and back to the soil through on-farm feeding of livestock, thoughtful manure and crop residue management, and the use of catch crops to reduce nutrient-leaching losses. The SOF aims to show Clemson agricultural and natural resources students and farmers across the state of South Carolina that, done right, sustainable farming can make more money for farmers, feed more people more efficiently, conserve natural resources and support surrounding businesses by circulating more dollars within the local economy. Shawn Jadrnicek, a former farmer and South Carolina extension agent, manages the SOF’s day-to-day operations, including soliciting and managing volunteer and paid student labor, giving tours to curious farmers, students and extension agents, and designing and implementing many of the sustainable agriculture systems currently being used. The SOF is a sort of canvas for Jadrnicek’s farming imagination. There are five greenhouses on the farm and each is oriented to take maximum advantage of passive heating and cooling techniques. A series of 55-gallon drums on the south side of one greenhouse collects solar heat during the day and emits that heat into the greenhouse at night. In winter each solar-heated barrel produces over 9,000 BTUs of heat per day, which means that the heat generated from all the barrels is equivalent to burning one gallon of propane. “The double-poly greenhouses with the 55-gallon drums give up to 13 degrees of frost protection without spending a penny on electricity or propane,” Jadrnicek said. To augment the passive heating system, the greenhouses utilize a hydronic closed-loop active heating system that pumps warm water through pipes and a grid of tubing. Plant flats are placed directly on the tubing grid and kept warm by heat transfer. In this way, heat is placed exactly where it’s needed at the soil underneath the plants rather than wasting energy by heating the entire cavernous greenhouse space. The greenhouses themselves are constructed of two layers of greenhouse plastic to reduce condensation and create insulation, and they are oriented to take advantage of the prevailing breezes. As the breezes move across the land, they are cooled by the ponds before entering the greenhouses. On extremely hot days, a recirculating fountain in an adjacent pond creates evaporative cooling. A series of solar-powered vents with expanding and contracting wax-filled switches allows hot air to escape and cool air to fill in behind it. A rainwater collecting system captures water and feeds a cistern and a series of ponds used for irrigation and aquaculture. The ponds are strategically placed to control temperature and create microclimates. Plants and vegetation around the ponds capture and channel wind to the greenhouses. The ponds are also designed to create microclimates that provide a diversity of habitat for a variety of plants. Some of the greenhouses partially encapsulate the ponds. Heat captured by the pond water is released into the greenhouses. Tilapia fingerlings are overwintered in one green-house pond and then transferred to outdoor ponds when the weather warms. The water in which the tilapia are raised, rich in organic matter, is used as fertilizer. Laura Lengnick, director of the sustainable agriculture program at Warren Wilson College in Asheville, N.C., and lead author on the recently released USDA report, Climate Change and Agriculture: Effects and Adaptation, says that the SOF’s microclimate and keyline management practices offer examples of ways to create resilience to climate change. The SOF is also experimenting with a prototype soldier fly digester. The digester is used to recycle food and plant waste from campus dining halls and the farm. The soldier fly larvae consume the waste. The larvae are then processed in the Clemson Biosystems Engineering laboratory, where they are dehydrated and pressed for oil to make biodiesel. The remaining soldier fly meal can be used to feed chickens or fish. The digester is connected to a greenhouse. CO2 and heat from the digester are captured inside the greenhouse, while the greenhouse warms the digester and extends the life of the soldier flies and their larvae. “We estimate that the school could produce over 4,000 gallons of oil and $40,000 in high protein meal if we used all the food waste on campus in soldier fly digesters,” Jadrnicek says. An enormous compost pile is cozied up against one of the greenhouses so its heat can help warm plants in winter. Water pipes run through the compost pile transferring heat into the hydronic system and reducing energy use. The SOF maintains soil health by cover cropping rather than using fertilizers from offsite sources. Even the crop rows are planted with sustainability and efficiency in mind. They are planted on the high points of the fields so they can stay dry on the low-lying piece of land. The beds slope off the rows at a half-percent grade or less, allowing the fields to drain gradually without water loss or soil erosion. The work that’s being done at the SOF isn’t theoretical. Like a stone dropped in a still pond, Jadrnicek and Zehnder hope the sustainable farming practices on display ripple outward. 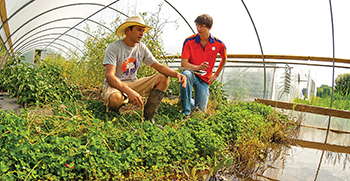 “The ultimate goal of the Student Organic Farm is to try techniques that will help farmers increase profitability and sustainability, and decrease farm debt. We also want to ignite the imaginations of the next generation of farmers,” Zehnder says. Extension agents from across South Carolina visit the SOF to receive training in sustainable and organic farming practices. The agents then impart what they learn to producers interested in implementing sustainable farming practices and diversifying into emerging markets, including organic production. During the 2012 Carolina Farm Stewardship Conference in Greenville, which was attended by more than 800 participants, the SOF conducted educational tours for agricultural stakeholders from across the Southeast. Lee Meyer, extension professor in the University of Kentucky’s Department of Agricultural Economics, praises the SOF for showing farmers that sustainable farming systems are profitable and practical. Students and faculty from a wide array of disciplines use the SOF for teaching and research. Horticulture professor Ellen Vincent takes her students on tours of the SOF. Organic produce for sale here! The Student Organic Farm distributes organic produce and partially funds its research and outreach initiatives through its Community Supported Agriculture (CSA) program. CSA shareholders pay an upfront seasonal membership fee that covers production costs in exchange for a weekly share of local in-season organic food. Fruit shares are also available during the Summer Share period. Though the fruit is not certified organic, the blackberries are treated organically, while the peaches, harvested from a local farm in Seneca, are minimally sprayed. www.clemson.edu/sustainableag/csaprogram.html or by calling 864-656-5057. In April, five Clemson alumni joined a select group and received the highest honor bestowed upon a former student by the Alumni Association. All five of these honorees have experienced success in their lives, personally and professionally. But one quality ties them together, more than all the others. And that’s their determination. They were determined in the classroom and on the playing field, in their communities and their careers, in their public personas and in their personal lives. And they bring that determination to their continuing involvement with Clemson. William L. “Roy” Abercrombie Jr. ’69 learned early on in his life that “Can’t can never do anything.” That can-do attitude was nurtured along by his professors at Clemson, including Dean Wallace Trevillian, who required shirts and ties at all his management classes. Though he started out in sales, Abercrombie ended up in banking. He rose to chair of the board, CEO and president at American Federal, where he served until 1997, when the bank merged with CCB–Central Carolina Bank. He continued with CCB until his retirement in 2003. He currently serves as chair of Colliers International–Greenville. Abercrombie is a life IPTAY member, WestZone Initiative and Heisman-level donor, member of the Leadership Circle, and former member and past chair of the Board of Visitors. He was instrumental in securing resources needed to enable the board to promote the University. Past chair of the Clemson Real Estate Foundation, he is a founding member and chair of the Clemson Land Stewardship Foundation. E. Mitchell “Mitch” Norville ’80 got his degree in engineering, but thanks to Professor Douglas Bradbury, he came to see himself as a thinker and problem-solver. He worked as an engineer for a couple of years before going to the University of Virginia to earn his MBA and continue his career at Boston Properties, one of the largest self-managed real estate investment trusts specializing in the development and ownership of office, industrial and hotel properties in the United States. Clemson may not be the city on his driver’s license, but it does have his heart. A board member for the Baltimore/Washington D.C. Clemson Club, he has made significant financial contributions to Clemson’s basketball program and the WestZone, where Gate 6 was named the “Norville Family Gate” in honor of his family. A founding member of the President’s Leadership Circle, he endowed the Ernest R. Norville Chair in Biomedical Engineering in honor of his father. He serves on the Clemson University Foun-dation Board of Directors, the President’s Advisory Board and the Advancement Board for Real Estate Development. At 6 feet and 135 pounds, James Warren “Jimmy” Addison ’68 didn’t see himself as a potential college football star. Fortunately, Coach Fred Cone thought differently and recruited the young man known as “the Needle.” Addison went on to capture honors including All ACC Quarterback, S.C. Athlete of the Year and an NCAA Post-graduate Scholarship. Three ACC Championships helped cement his membership in the Athletic Hall of Fame. His determination on the field was matched in the classroom and in ROTC. A member of Scabbard and Blade, he graduated with both the Norris Medal and the Algernon Sidney Sullivan Award. He went on to law school at the University of Virginia and now chairs the Commercial Real Estate Section at Troutman Sanders LLP. Addison has served on the Alumni Association Board of Directors and the Advancement Board for the School of Humanities. He also established the Virginia and Bill Addison Endowment for the Humanities and has served as chair of Clemson’s Athletic Hall of Fame. In addition, Addison has given much of his recent time to the Clemson University Foundation Board. Russell Carlton Ashmore Jr. ’50 has always had a way of turning roadblocks into opportunities — in athletics and academics, professionally and personally. When his football career ended for medical reasons, he served as an Army cadet and focused on his studies. When his pre-med dreams met a queasy stomach, he still found ways to provide medical care, both here and abroad, to those unable to afford it. After graduation, Ashmore served in the U.S. Army and the Reserves, then returned to Clemson to pursue his interest in ceramic engineering, after which he took a position at General Shale in Tennessee. While on his way up the corporate ladder, he was convinced to return to the family business in grading, paving and excavation. He not only helped guide the family business, but also served as an industry leader. For more than five decades, Ashmore has been a member of IPTAY and an annual donor to the Clemson Fund. An active supporter of Clemson Corps, he was one of the principal organizers and fundraising chair for the Military Heritage Plaza and Cadet Monument. President of the Class of 1950, he is co-founder of the Taylors Clemson Touring Club — the originators of orange overalls at football games. “There’s never been a Duckworth who didn’t want to win,” says Edgar James “Ed” Duckworth ’61. But as competitive as he may be, Duckworth believes that it’s not winning or losing that matters in the long run, but how you play the game. And though he is a supporter of Clemson athletics, it is the philosophy of “One Clemson” that has captured his heart. Duckworth graduated with a degree in civil engineering, then transitioned into the world of finance, where he has had a 40-year career in the securities industry as a broker, dealer and financial adviser. He is currently the senior member of an elite group of financial advisers for Morgan Stanley in Atlanta. A member of the Clemson University Foundation Board of Directors, Duckworth is vice chair of the finance committee and a member of the Will to Lead National Campaign Committee. He was instrumental in helping the Atlanta Clemson Club fund the Clemson Tiger Paw license plate in Georgia, and continues to support IPTAY, Clemson Fund, alumni activities and the Class of 1961. He and his family recently made a major contribution to build the Duckworth Family Pavilion to support Clemson’s tennis teams. For the first time in 14 years as Clemson’s president, the volume of mail I received this semester was so great that I could not even consider answering all of it. So forgive me if I use this space in Clemson World in a very personal way — to say thank you to alumni and others who sent messages of support, encouragement and gratitude, and to reflect on what I learned during my “medical sabbatical” and return to duty this spring. First, I learned that the “Clemson Family” is very real. After my heart surgery in January, Marcia and I received literally thousands of cards, letters, emails and posts to a special “get well” blog. And when I say “literally,” I mean it in the classic not ironic sense — literally thousands! These messages were a vital part of my recovery. Some were heartfelt and touching. Others were funny. Many alumni welcomed me to membership in the “zipper club.” They shared stories of their own or a family member’s improved health and well-being after the same surgery. Second, I learned that it is humbling and healthy for a pilot to step out of the cockpit and into the passenger cabin once in a while. When you do, you quickly learn there are many people capable of flying the plane. To paraphrase something former Supreme Court Justice Sandra Day O’Connor once said: When you think you are important or essential, stick your hand in a bucket of water and then pull it out. The hole you leave behind is how much you will be missed. Clemson University is and always has been larger than the individuals who serve her at any given point in time. Today, we have many, many dedicated and able folks working for Clemson’s success — faculty, staff, administrators, Trustees and volunteer leaders. So I am also grateful to Chairman David Wilkins, Provost Dori Helms and all others who stepped in to keep the University machine running smoothly in my absence. Finally, I learned that though my arteries were blocked, my heart was and is very strong. Eight weeks after my surgery and two days after this picture was taken, Marcia and I left for a trip to Germany and Italy. I met with BMW’s Board of Directors in Munich, and we attended the 40th anniversary celebration of our architecture center in Genoa. It was a wonderful trip in a beautiful place. We were happy to be there, and even happier to be home. I returned from my medical leave on March 29 and two weeks later asked the Board of Trustees to begin its search for the 15th president of Clemson University. I will remain in office until the new president is found and begins work. After that, I will begin preparing for the next phase of my Clemson career as a faculty member in the School of Architecture. This is a transition I had always planned to make, and it is not directly related to my surgery. I feel good, have a high level of energy and plan to remain engaged. The personal journey I have taken in the first half of 2013 led me to conclude that this is the right time to “change majors” from the president’s office to Lee Hall simply because Clemson University is in such good shape. We have a high demand for everything about Clemson. We’re attracting great students, faculty and staff. We are blessed with alumni support and a capital campaign that has been very, very successful. We are financially healthy; in fact, we are in better shape financially than we were before the Great Recession. And we have a plan that has broad support by our alumni and, most importantly perhaps, by our Board of Trustees. We are on an upward path, and I pledge to do everything I can to continue this positive momentum. It has been the honor and privilege of my life to serve as your 14th president, and I will always be grateful to Clemson students, faculty, staff and alumni for giving me a chance to serve my alma mater in this special way. Thank you very much. Go, Tigers! As you enter Hardin Hall, you’re greeted with an artistic rendering of Clemson’s history. Some very abstract, others more representational, 84 tiles spread across a curved wall that stretches for 60 feet. Installed in 2004 in the then newly renovated home of the history, philosophy and religion departments, the project was sponsored by the Art Partnership Program and funded through the R.C. Edwards Endowment. Artist Kathy Triplett was chosen through a regional competition that spanned six Southern states. The tiles range from the expected — commemorating Thomas Green Clemson and M.B. Hardin and the always present Tiger — to the unexpected — depicting the development of the Phorid Fly and the illusion of parallel lines. In an interview in 2009, Triplett compared the work to a poem. “At first you grasp it with the heart,” she said. 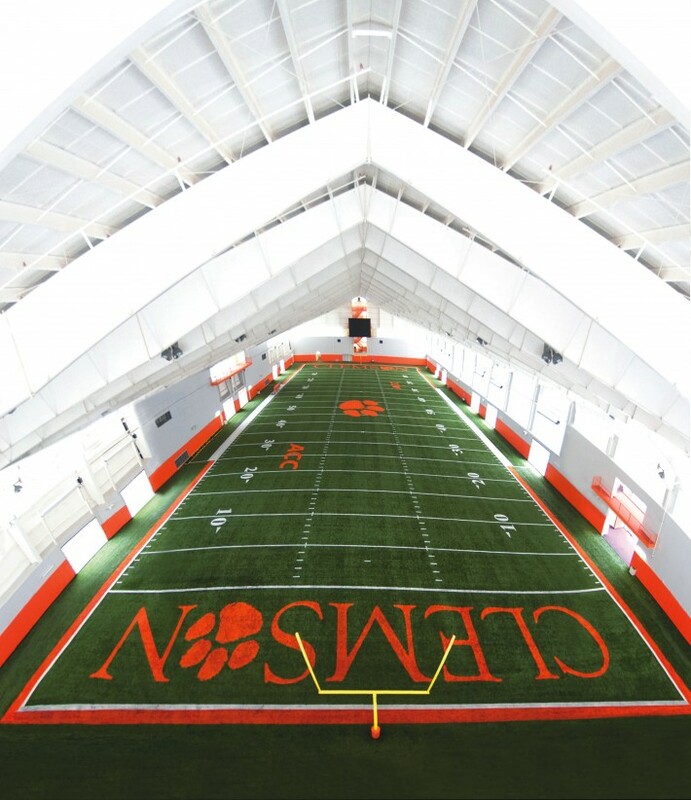 On Jan. 25, with the weather demonstrating the need for such a facility, fans and friends gathered to dedicate and tour the new Clemson Football Indoor Practice Facility, an 80,000-square-foot, $10 million structure. Adjacent to the football practice fields and the indoor track facility, it includes a full-sized synthetic turf football field. High above the field, coaches can view practice from a long platform. In order to simulate a gameday experience, there is a fully functional, game-ready scoreboard inside the facility along with four play-clocks and a video board equal to the size of the ones in Memorial Stadium. It won’t be just the football team that uses the new facility; men’s and women’s soccer will share the strength and conditioning area and training room as well as equipment storage space. Director of Athletics Dan Radakovich, who was nearly two months into his job at the time, said the hundreds who attended the ceremony demonstrated the passion that was the very reason he came to Clemson. Thanks to a recent $1.05 million gift from Joe ’79 and Gretchen Erwin, co-founders of Erwin Penland Advertising, Clemson is now home to the Erwin Center for the Study of Advertising and Communication. Initially, the Erwins’ gift will provide up to five new courses to support a new emphasis area in advertising and communication for communication studies majors and as a minor to students in other majors. Many of the classes will be taught in collaboration with industry experts at Erwin Penland. The communication studies department currently offers emphasis areas as diverse as sports communication, communication and the law, and health communication. Erwin said that he and Clemson representatives will be meeting with major brands, marketing agencies and other industry leaders across the country to solicit input aimed at ensuring that the center develops students who are uniquely qualified to drive the future of marketing communications. Beyond the active faculty, staff and students found on the Clemson campus, there is another group that plays an active part in scholarship and service to the University and the community. This year, Emeritus College at Clemson celebrates 10 years. At many institutions, retired faculty organizations are focused on benefits such as ID cards, parking permits and access to library services. While those things are certainly appreciated by the 700 members of Clemson’s Emeritus College, the organization is much more than that. Their mission also includes supporting Clemson University’s teaching, research and outreach missions. These active retirees continue to research, travel, present papers and serve the community. They have served as mentors to international students, administered and graded language proficiency tests for international graduate students, raised funds to support the Emeritus College and the general University. Many were involved with a project of identifying the places and people in many photographs held in Clemson’s archives. For more information about the Emeritus College, or its 10-year anniversary, go to clemson.edu/emerituscollege.